"In my opinion, the least bad tax is the property tax on the unimproved value of land, the Henry George argument of many, many years ago." Q. Is there no tax you like? A. Yes, there are taxes I like. For example, the gasoline tax, which pays for highways. You have a user tax. The property tax is one of the least bad taxes, because it's levied on something that cannot be produced — that part that is levied on the land. So some taxes are worse than others, but all taxes are bad. Milton Friedman had impeccable right wing credentials and was a darling of the Reagan and Thatcher regimes of the 1980s. But when it came to taxation he certainly had the right ideas. Wouldn't a land tax be bad for those who want to preserve the natural environment? Well you simply create zero ratings based on district zoning for these things. 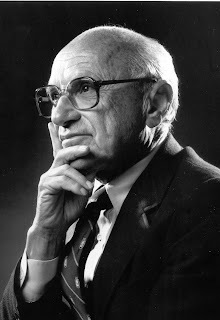 Will the Government heed Milton Friedman's ideas? Don't be silly.